I have lots of food that I've made or like to eat but am way too embarrassed to tell anyone about them. Some things I've made out of total desperation, like that time Junior year when Neal and I ran out of food a few days before winter vacation but didn't want to buy new food so we had to "get creative." We promised never to tell anybody about the food that we made that day. Some other food combos I just tried out because I felt like it, like kimchi and mac and cheese, which used to gross people out but then everyone got all crazy over Siracha and you know what, it's totally the same idea. 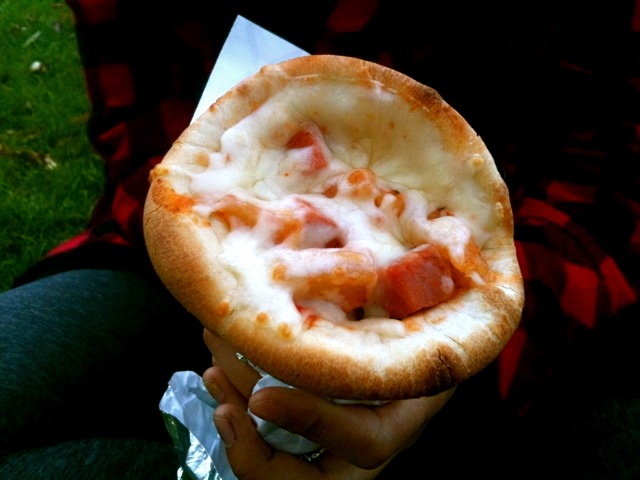 And then there are some things, like pizza cones, that are so totally trashy that I've only had it once (or twice...) and can't really admit how much I loved it while looking anyone in the eye at the same time. But the thing that I've gotten the most side-eyes for is one of my favorite snacks: peanut butter and pickle sandwiches. Gus from the cartoon "Recess" (which I still watch every morning, by the way) bought a PB&P sandwich to lunch in one episode, so I decided to make it, and I've been eating them forever now. I've always been secretive about it because it seemed to weird everyone out. I maybe have even lied and pretended I thought it was gross too. I don't think any of my roommates have ever seen me eat or make one because I am so sneaky about it. But this morning, I saw this article on the NY Times about PB&P sandwiches, so today I feel brave enough to say that I love these sandwiches so hard. My favorite way to make them (like I made this one after I got home today) is with creamy crappy peanut butter (none of that fancy grind-it-yourself goop, it is not good, I don't care what you say) and extra sour pickles. Then, this is the best part, I like to give it a little grilled cheese treatment by toasting it in some butter on the stove so that the peanut butter gets a little melty and warm and makes the crunchy-sourness stand out even more. That's the beauty of this sandwich, everything balances each other out. Creamy and crunchy, sweet and salty, sour-y and buttery, it's a dream. Don't knock it til you try it. For real. ok I LOVE PB and pickle, same with me, has to be crappy creamy sweet PB. I have never tried grilling it tho, that sounds awesome. I love grilled PB&J so much so I bet it would be awesome.